Get the most out of your prospecting dollars. 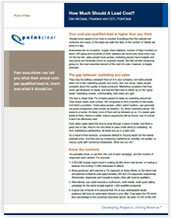 This informative whitepaper will give you a better understanding of how much a lead should actually cost. If marketing's definition of a lead is "Fortune 500 CIOs in any industry" and sales' is "IT managers in the security realm," it's clear there's a disconnect. Chances are pretty good marketing is frustrated their leads aren't appreciated, and sales is complaining that marketing doesn't deliver what they need. 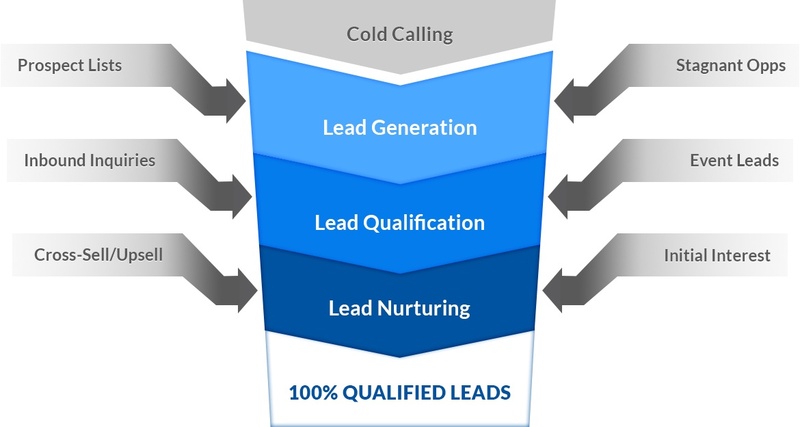 PointClear works with both marketing and sales to define exactly what a sales-qualified lead is—before a single call is placed: Right person, right company, right need, right time. This important part of the on-boarding process eliminates finger pointing later in the game, because everyone agrees up front exactly what a lead is. Don't depend on just inbound to hit revenue goals. To truly understand how inbound contributes to the bottom line, you need to measure cost-per-lead and conversion rates. Discover why inbound isn't a stand-alone tactic. Account-based marketing is a strategic approach marketers use to support a defined universe of accounts and named accounts. It also includes support for the post-sale customer lifecycle using marketing's toolkit to contribute to the overall customer experience. ABM provides guidance on how to deliver the insights, goal setting, strategy and planning, integrated marketing execution, and sales alignment required to support growth, retention, and loyalty objectives. It also provides guidance on how to measure marketing's impact beyond demand creation within defined groups of prospects and customer accounts. ABM helps to evolve the role of marketing to reflect a stronger alignment with sales objectives and customer needs to deliver better execution and revenue outcomes. The account-based marketing (ABM) approach applies time-tested B2B marketing and sales principles to the challenge of selling to businesses by targeting company accounts rather than individual sales leads. ABM creates hyper-personalized interactions far more specific and relevant than traditional marketing that enable sales and marketing teams to land more accounts and expand existing ones, even in the most complex sales environments. 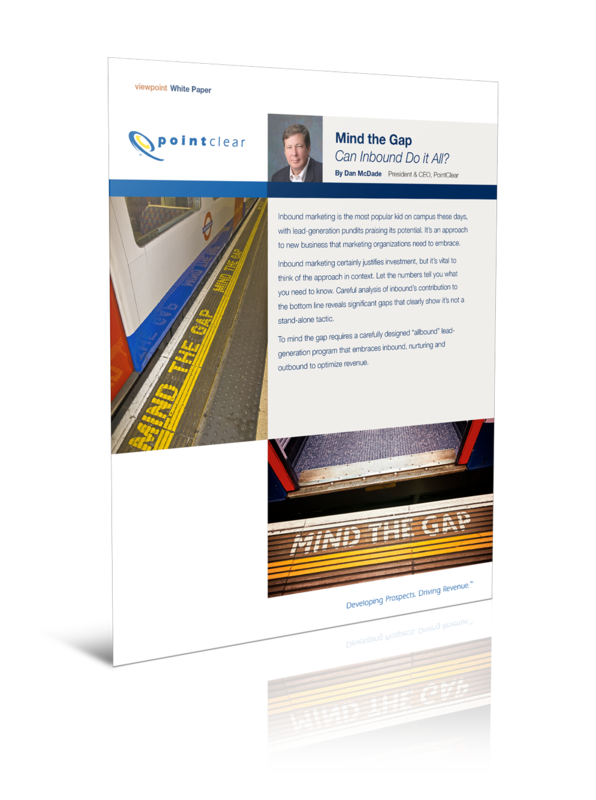 Few companies have sales and marketing resources to cover the market like PointClear. If only a fraction of your target market is contacted, only a fraction of the deals are going to you. The rest will decide on a competitive solution because they don’t know about yours. It's PointClear’s job to make sure every targeted account in your universe knows you exist and understands your value. At the core, our approach is different. We don’t just call your targets—we have conversations with them. At every touchpoint, we gather important information about them, their companies and their industries. We provide you with the intelligence that enhances the sales process, including information about competitors, immediate priorities and triggers, and marketplace challenges and trends.